The original Mathis game in development was a surprise launch. 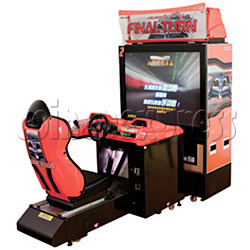 Ace Driver 3: Final Turn(System N2 Hardware) was launched with four network deluxe cabinets on 50inch high resolution projector. Ace Driver(System 22 Hardware) was launched in 1994, with a sequel launched in 1996; the game called by many at the time as representing Pole Position Final Lap in 3D. The surprise launch of this F1 style game will give racing driver more exciting experience.